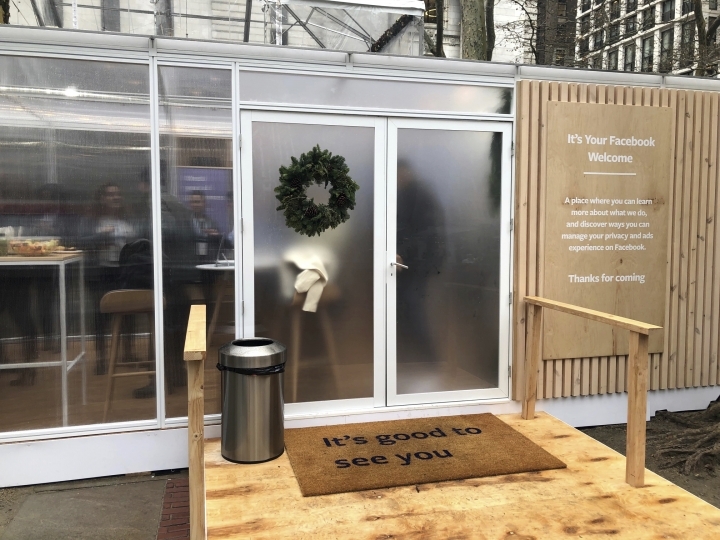 NEW YORK — Wrapping up a year of privacy scandals , congressional hearings and a host of other problems, Facebook hosted a one-day "pop-up" event in New York City's Bryant Park on Thursday, hoping to talk to users about their privacy settings, ad preferences and whatever else may be on their mind. Amid the park's holiday market, food stalls and a busy ice-skating rink, the company set up a trailer to lure in passers-by from the cold with hot chocolate. Some did, though journalists and Facebook employees in gray fleece sweaters far outnumbered members of the public as of midday. Facebook's chief privacy officer, Erin Egan, acknowledged that only a few of Facebook's more than 2 billion users are likely to stop by. But she says the hope is that those who do will "teach others" about what they learn. Facebook has held similar events in Dubai, Dublin, London and Cologne, Germany, all within the past year. For those who did stop by, it was a rare chance to speak to a real person from Facebook about concerns such as being shut out of an account for using an alias, receiving a notification about a login attempt, or seeing what information the social network uses to target them with ads. 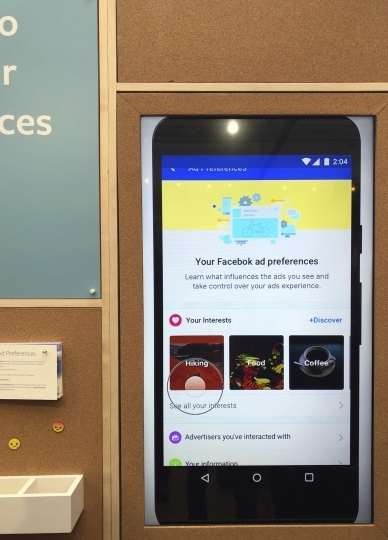 The trailer was outfitted with posters telling users that Facebook doesn't "sell" their information (true, though it does use people's information to sell ads targeted at them), prompting them to ask questions and take brochures on managing ad preferences. The trailer's decorators also threw in a few signs usually seen at Facebook offices, such as "be bold" and "always be open." Egan said users at similar events generally wanted to know about who can see "their stuff" and how ads are targeted to them. As for Facebook's privacy work in the past year, she acknowledged there is work to do but, asked to give a letter grade, she granted the company a "B." By 2019, she said she hopes the improvements will result in an "A." Privacy wasn't a big concern for Janet Fabian, who popped in with a friend. 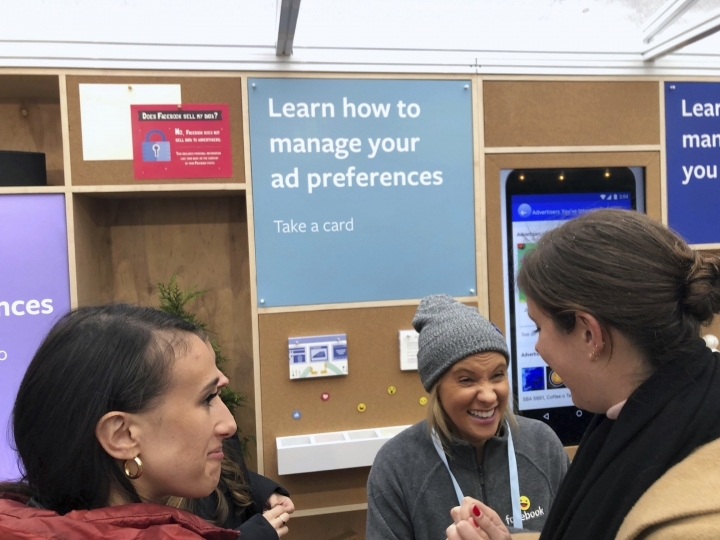 She said the pop-up was "great" because "certain things you really don't know who to ask." Fabian, who lives in New York and gave her age as "over 50," said she's been on Facebook for nine or 10 years and loves it because it is easy to use. She asked a Facebook employee about notifications she's received that someone else was trying to log in to her account. 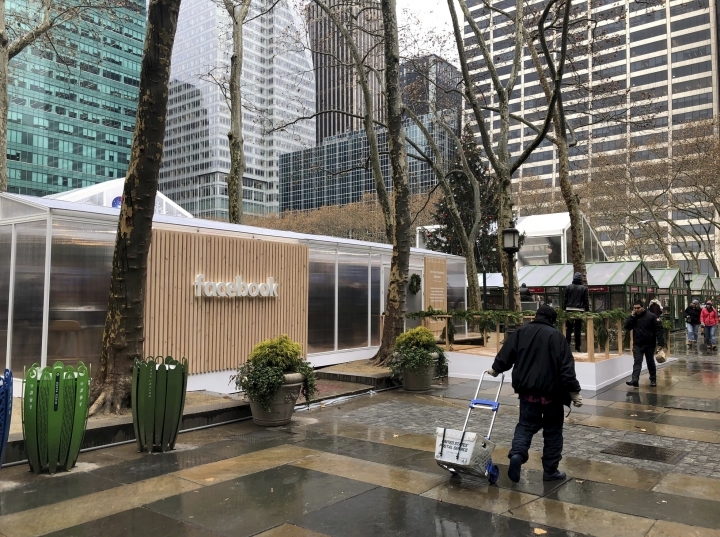 As for Facebook's privacy troubles — the company's impetus for setting up the pop-up — she said she was aware but not too concerned. "I've got nothing interesting to give them," she said, adding that she's much more worried about her financial information being compromised in hacks such as the recent data breach at Marriott-owned hotels. James Matias, from Long Island, New York, meanwhile, nursed a hot chocolate and said that, while his brother-in-law and wife are "Facebook people," he doesn't use it much. "I am not good at surfing it," he said, adding that telling people what he had for breakfast seems useless and he prefers talking as a "communications device." "However, Facebook is a wonderful tool for connecting with people you haven't seen in 50 years," he said.